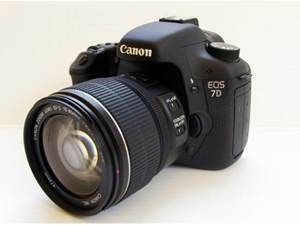 Jan Ozer favors the Canon 7D’s results in video mode over two camcorders–Canon’s XH A1 and JVC’s GY-HM700U. My colleague at millimeter magazine, Jan Ozer, has posted an in-depth look at Canon’s EOS 7D at his blog, which you can find here. With its maximum record time of about 14 minutes and primitive audio capabilities, Jan advises, the 7D isn’t the optimal first or only camcorder you should consider, though he calls it “easily the most capable” digital SLR that he has worked with. Priced around $1700 with a kit lens, with its introduction this past September the EOS 7D offered an alternative to the pricier top of Canon’s HDSLR line, the 5D Mark II. I use the past tense, since Canon delivered a mid-January price cut on the 5D, bringing it closer to the 7D by knocking the retail price to $2499 (sans lens) with a mail-in rebate (B&H pricing here). The price drop in mid-January serves a strategic purpose: the rumor going around is that Nikon is readying a number of new cameras for introduction within a few weeks, with new HDSLR-capable models sure to be among them. Canon obviously hopes to sweep up any wavering potential buyers it can before its rival’s launches.